LOS ANGELES — On one shoulder, there's a voice giving Lonzo Ball a patient message. On the other, a different voice offering tough love. Who should the Los Angeles Lakers' rookie listen to? That's a complicated question for a 20-year-old stuck between two divergent mentors. Who is he listening to? Probably both. But one, in particular, has grabbed the mic and turned the speaker up to 11 early in the 2017-18 season. 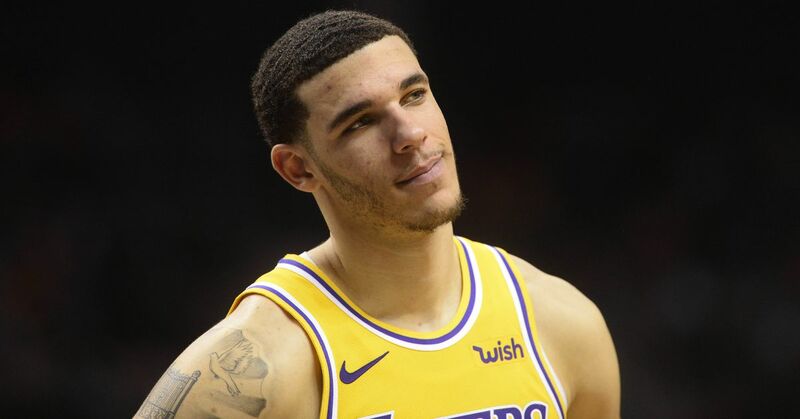 "[Lonzo] doesn't look like he's searching for nothing," LaVar Ball said on Friday after the Lakers let one get away from them at Staples Center against the Phoenix Suns, 122-113. "He's trying to get that W—that's what it is." Two nights ago, the Lakers' point guard logged the second triple-double of his career in a 127-109 win over the Denver Nuggets, joining fellow rookie Ben Simmons along with Magic Johnson, Oscar Robertson, Connie Hawkins and Hambone Williams as the only players to record multiple triple-doubles within their first 20 games, according to the Elias Sports Bureau. Every few games, Ball gives a glimpse of what inspired Earvin "Magic" Johnson to ask the team's No. 2 pick in June to "leave me one or two of my records. Don't break all my records." Adding to expectations is his father, a media magnet who is now making the rounds on CNN over a spat with President Trump over a minor international incident sparked by middle child LiAngelo Ball. LaVar has helped Lonzo Ball into a superstar before he even played a single minute with the Lakers. Meanwhile, his actual game has been a mixed bag. Ball has shown the ability to both run a team and contribute defensively, but the obvious complaint is his 31.3 percent shooting from the field, coupled with 22.8 percent from three-point range. For LaVar Ball, it's not about efficiency but results. "Go get the W. Do whatever it takes. That's why I'm down here saying, 'Rebound,'" he continued. "He's been away from me too long. I see tendencies in his game—they're trying to baby him a little bit." Lonzo Ball said that one of the pieces of advice Brian Shaw told him was that when he rebounds, his overall game is better. Lonzo took it to heart with his 16 rebounds tonight. Lonzo Ball credited assistant coach Brian Shaw for urging him to hit the boards more aggressively. Both his father and the Lakers coaching staff want the same result for the point guard but have very different approaches. "They're soft. They don't know how to coach my son. I know how to coach him," LaVar Ball said. "I tell him to go get the victory. Stop messing around." Does he have a problem with coach Luke Walton? "No, I have a problem with losing," Ball responded. If Ball is old school, Walton has a modern approach to developing young players. "This is a great teaching moment ... everybody in the NBA is good. Just because we beat a team twice doesn't mean we're better than they are," Walton said of the Suns. Like all 30 franchises, the Lakers would love to win the title, but Walton's primary goal is to groom the roster until Los Angeles has the pieces necessary to truly compete. "As you're building, you're on that path. It's never [smooth]," he said. "It's never just you get it and all of a sudden you don't have slippage anymore. Every team goes through it." "The important thing for us is that we learn from our mistakes, we keep our head up, we keep working and grinding away to get where we all want to be," Walton continued. That's the kind of talk LaVar Ball seems to shun. "What I mean by babying [Lonzo], 'He'll figure it out,'" Ball said. "It ain't about that. 'Be patient with him?' Ain't no patience if you're winning." "They're letting it go too easy, saying they're a young team," he continued. "Forget about that! Put the [onus] on them. Say, 'You guys need to win. You've got enough talent. Win some games.'" That begs the question, is there more to the game than winning? What helped Lonzo Ball win at Chino Hills and UCLA may not translate fluently in the pros. His shooting technique clearly hasn't. There may be no shortcut to "just win" in the NBA, especially when Ball probably needs to rework his entire shooting form over the offseason. That's not to say Walton has greenlighted losing for the sake of development. That's not the message the players have received. "I don't think it's ever the time [to accept losing]," Brandon Ingram said. "We're all basketball players. We all think the game [through]. We have to just continue to learn the process ... until we can find a way to try to win consistently." Ingram with the keyword that has become a mantra in Philadelphia. Trusting the process has yielded Joel Embiid, Ben Simmons and a Sixers squad that has a bright future ahead. Walton's focus day to day must be on winning, but to do so, he needs to let his young players make mistakes while gaining the experience they need to succeed. "The line is there and you walk that line every day because you need to encourage them to have the confidence in themselves," Walton said. "When they're at this stage of their careers, [sometimes] you have to point out that that's not how you do different things." Lonzo Ball echoed his father after the loss to Phoenix. "I'm never going to say losing is OK. My whole life, I've ain't played to lose. I'm not going to start now," he said. "When you're [playing] at home you don't lose. It ain't OK," said LaVar, who implied the players shouldn't take moral victories in defeats. "That's why they're so cool with losing by five or six, [to] say, 'We was in the game.'" One year into the program, Ingram is the better case study of the Lakers' player development. Ingram has averaged 18.7 points a game over his last three, showing growth in his ability to attack the basket and finish. Like his teammate Ball, Ingram is just 20 years old and far from a finished product. "I'm just trying to figure things out. Sometimes you learn things afterward," Ingram said. "When you drive, you may have a pull-up jumper ... pull up and you may have [had] a drive to the rim. I'm just trying to learn the game all the way through." As a rookie, Ingram averaged 7.7 points a game on 35.6 percent shooting through his first 20. With 17 played this season, Ingram is at 14.8 on a vastly improved 44.6 percent. Neither Ingram nor Ball should be babied by Walton's staff, but there's no denying that they both have a lot to learn. They're both two years younger than impressive rookie Kyle Kuzma, who spent three years at Utah learning his craft. The senior Ball is right in that a team should never accept losing. The NBA has worked to integrate lottery form to further disincentivize failure. But a good coach will put the effort into making sure his players learn how to properly apply the fundamentals of basketball while helping to build confidence, all while trying to win games. There's no perfect formula, but simplifying it to just "do better" isn't a real answer.